Third-world airport makes car travel obsolete. The snowstorm that slammed the East Coast made for a brutal Monday-morning commute for many taking the trains, subways, and buses in and around New York City. And today we know the slightly above average temperatures have melted your neighborhood slush mountain into a lake-size broth of ice chunks, grime, and gasoline, with a dash of dog poop. 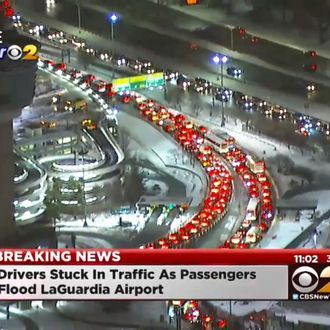 But now it’s time to turn our attention to La Guardia Airport, where in these trying, post-blizzard times, the bustling transport hub may have actually laid claim to the official title of commute from hell. Thousands of flights were canceled up and down the East Coast thanks to Winter Storm Jonas. So when airlines began flying again Monday, things were bound to be a bit chaotic as people rushed to the airports. But maybe nobody expected the massive gridlock into and out of La Guardia, a traffic jam so intense that people were stuck for up to five hours. General evening rush-hour traffic and an ambulance fire near Flushing Meadow Park added to the backlog of people desperate to get out of snow-laden New York. “We’ve been stranded at LaGuardia Airport for about four hours. We dropped off Raul around 6:30, it’s 10:21 — we still can’t get out. He took off and landed already. He’s already home,” one man said, as a silent rage probably burned inside of him. Stay away from Laguardia airport. If you have a flight, change it. Don't even come near it. Some people were so desperate they gave up, got out of their cars, and trekked along the parkway’s shoulder, suitcases in tow. The taxi lines also wrapped through the terminals, with people waiting up to two hours to just get in a cab. The standstill on the parkway was so horrendous it also delayed flights, reports the Post, as it trapped the jet-fuel trucks that were trying to get to the tarmac to give departing flights a jet-fuel fill-up before takeoff. That caused incoming airline delays, too, as planes couldn’t land because there wasn’t any place to park. Also Monday night, a plane headed to La Guardia from Charlotte got zapped with a green laser light while soaring above Westchester. Police sent a helicopter out to search for the culprit, but no arrests have been made. And an honorable mention also goes to a raging car fire near Terminal C Monday morning that sent dark, billowing smoke up into the sky over the airport, an ominous sign of what was to come.